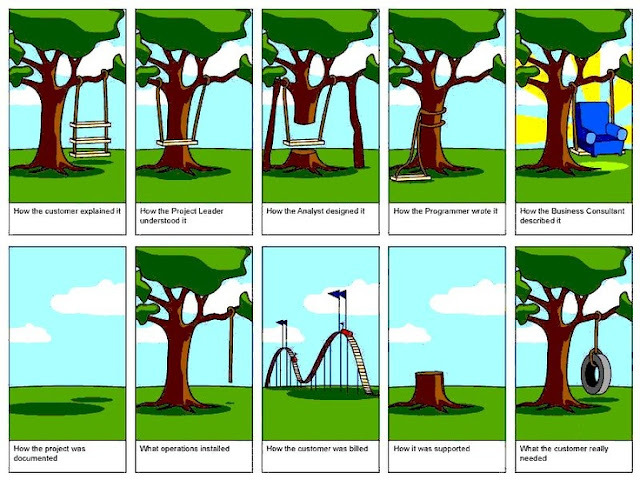 I have about 15+ years of Software Development Experience and have been working on Agile Projects since about 2006. My First Formal Introduction into Agile was through a Training by Thoughtworkers (Thoughtworks is a Leading Agile Company). This was while I was a Senior Software Engineer at Huawei, Bangalore, India. I have worked on Agile/TDD/Pair Programming (Various Variants) in multiple companies including Huawei, Symantec, Yahoo (Altaba), Misys (Finastra). Recently and Once Again, I attended a Formal Classroom Training (Company Internal) on Agile. I jotted down the most important points and now am presenting it in this Blog. I hope it helps and becomes a Ready Reckoner for Understanding/Learning the Agile Basics (Needs, Motivations, Practice and Evolution Story). We will start with Dilbert! Royce called them "Implementation Steps to Develop a Large Computer Program for Delivery to a Customer". The testing phase which occurs at the end of the development cycle is the first event for which timing,storage, input/output transfers, etc., are experienced as distinguished from analyzed. These phenomena are not precisely analyzable. They are not the solutions to the standard partial differential equations of mathematical physics for instance. Yet if these phenomena fail to satisfy the various external constraints,then invariably a major redesign is required. A simple octal patch or redo of some isolated code will not fix these kinds of difficulties. The required design changes are likely to be so disruptive that the software requirements upon which the design is based and which provides the rationale for everything are violated. According to Royce; In the Process Model "The Design Iterations are never Confined to the Successive Step", and for that model without iteration is "Risky and Invites Failure". As alternative Royce proposed a more Incremental Development, where every next step links back to the step before. 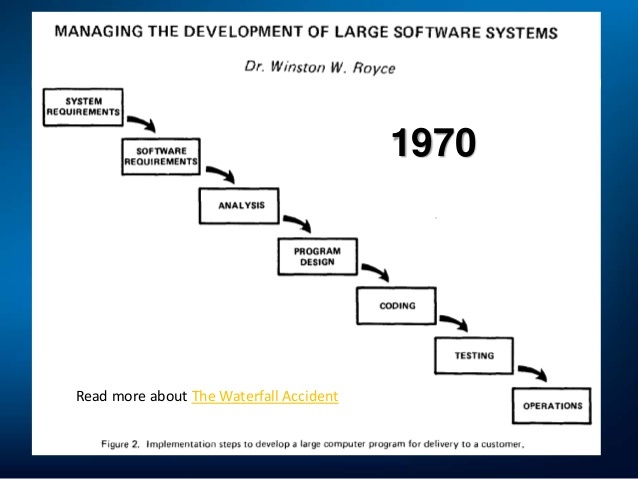 Sometime Later and Ignoring the Shortcoming stated by Royce, the American Department of Defense accepted this "Waterfall Model" as the Standard for Defense System Software Development. It promoted the One-Pass Document-Driven Waterfall process. It contained sentences like “The Contractor shall establish the Top-Level Design of each CSCI by Allocating Requirements from the SRS and, if applicable, IRS to the TLCSCs of each CSCI.” This was the beginning of the real widespread usage, application and practice of the "Waterfall Model". This model was drafted under the document DoD STD 2167. The Principal Author of this document later regretted promoting such a rigid process. He also agreed that he was not familiar with a Iterative, Evolutionary Requirements Based or Incremental Development Process. Even though, In 1987 DoD started warning against the "Waterfall Model" - It was in such widespread usage that Organizations all over the World refused to update their Process in their Software Development Documents and/or in Real Practice. 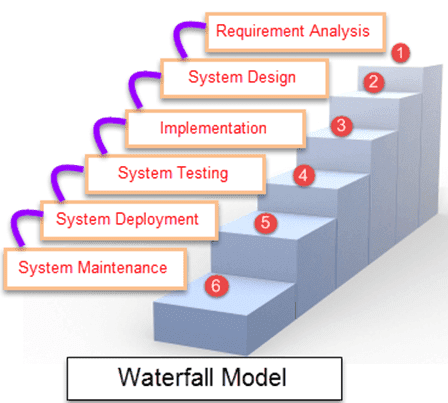 The above events related to the Waterfall Process or the Original/First Formal Software Development Process are often termed as the The Waterfall Accident. As Everywhere Else, I am representing the Real-World Situation in Usual Software Project Development (Aggravated by The Waterfall Model). There is this one more diagram, that also emphasizes the reason as to why the above situation is created. It is primarily due to the rigidity in the process and also the barriers to move back and forth between various phases. The diagram is good in proving that without iterative back and forth movements between the core phases, neither changing requirements can be incorporated reliably nor can any newly identified constraints. This was the beginning of the Agile Movement / Revolution, that now is the Software Development Process of choice across the world. 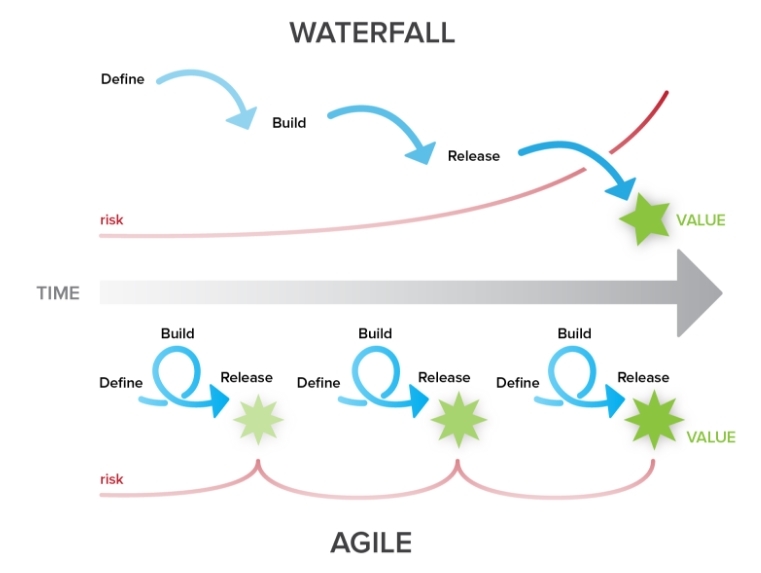 Since we were discussing about Waterfall, you should first understand how the Agile Process can/should be Visualized. This will allow you to understand the Flexibility, Adaptive, Iterative and Incremental Nature of Agile Methodology. Also, from the perspective of the Stakeholder(s) Developing and Delivering the Software, It can/should be visualized as the following. This is to understand that the Chunks of Work are better manageable than getting bogged down by the Big Block of Work. It also should allow to Increase Quality, Manage Timelines, Continuous Delivery and Achieve Greater Customer (For Whom the Work Is Done) Satisfaction. I am also mentioning the names of these original 17 Software Developers who were the original signatories of the Agile Manifesto. They should continue to find special mention in years to come, as they were the ones instrumental in Formalization of such a game-changing Software Development Process. Together, they published the Agile Manifesto for Software Development. Since Agile only provides Values and Principles to guide Development Teams, there are many Methods or Methodologies through which Agile is Implemented. Each of them may require an article of their own. Also, I am familiar with only about 5-6 of these Methodologies to really be able to write about them comprehensively. I am enlisting first the Software Development Frameworks through which Agile can be Implemented. I am providing only the Topmost Implementation Methods, as per my selection. There may be many more ways to Implement Agile, with some or the other Innovative Value Add being done to the Agile Process every now and then. I have also provided the Wikipedia Links so that you may directly read about them. Apart from the above mentioned Agile Development Methods, there are multiple keywords and practices that are associated with Agile Development. I am only mentioning the ones that I am most familiar with, along with their direct Wikipedia Links. Openness: As we Work Together, We Express How We're Doing, What's in Our Way? and Our Concerns, so they can be addressed. Transparency: Advocates that the Significant Parts of the Process to be Visible to All. Inspection: Scrum Artefacts Constantly Inspected as also Progress towards Milestones. Adaptation: Deviation of any Process Aspects Outside Acceptable Limits must be Adjusted. The real world Implementation of Agile through Scrum has Three Important Roles. Protects the Scrum Process and Prevents any Distractions. I myself have worked for Top Software Companies of the World including Yahoo (Altaba), Symantec, Huawei, Siebel (Oracle), GXS (OpenText) and Misys (Finastra). Also, I have worked for some well known IT Services/Consulting Companies like Infosys, Headstrong (Genpact) and also relatively smaller Product Brands like Persistent and Aptean. Since I started my career in 2003, I saw the move towards Agile Adoption (Variants, Loose Variants) in Various Companies throughout my Experience - It was really exciting for me as a Software Developer since the greatest crib that I ever had was Excessive Software Documentation and the Lack of Energy and Excitement. The idea of Regular Delivery of Working Software (Demos) was inherent and natural to me as a Software Developer. It is the one that brings the Greatest Joy (Apart from Everything, as Discussed in Earlier Sections) in Software Development. I am enlisting few of the Other Companies that have Adopted Agile (or are Agile Proponents), across Business Lines. From my Own Experience, I can comfortably say that almost all companies in the world now use Agile/Scrum (and/or Variants) as one the Software Development Methodology of Choice. Also, Most Software Development Companies (Read Product Software) were always almost Agile, but now may be using the Formal Agile Principles as their Driving Factor to achieve Greater Efficiency. Many Companies use Variants of Agile or Mix of Agile with Other Processes for their Teams. Agile is also not restricted to Software Development - There are Industries and Functions that now use Formal Agile Methods for their Deliverables and Daily Tasks. You will come across these Tools and Technologies that are used to Implement or Drive Agile/Scrum Methods and Practices in Organizations Worldwide. There may be many more Tools, Frameworks, Technologies - But I am only enumerating either the ones that I have come across or the Ones that are Popular. They may not be directly Agile Tools, but ones that either Accelerate Agile, Used for Agile Project Management, Agile Planning, Agile Task Management and Continuous Integration/Delivery. Since we are now familiar with the very basics of Agile and Scrum, It is time to move on and find out the Statistics in Real-Time. These statistics reveal that even though Agile is no silver bullet, but it does provide a very high project success rate. Usually, Companies mix Agile with Other Existing or Newer Development Processes to try and increase success rate, as per the Context. This article will try and cover the reasons for the failure of Agile Projects - From the above statistics we can easily observe that the Project Success Rate of 42% in Agile is almost 1.6 times that of Waterfall. 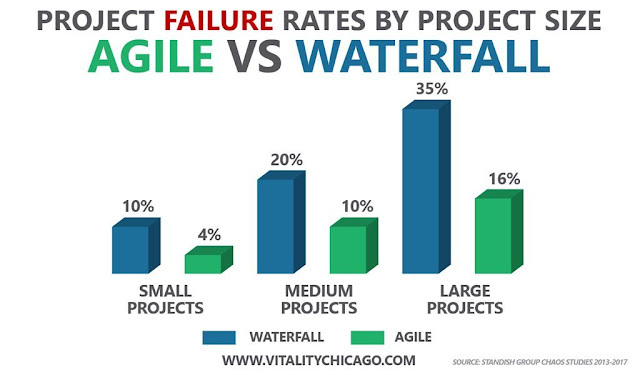 At the same time the ratio of Failure or Challenged Projects is 1 : 1.27 (Agile : Waterfall). The Best Candidates for Waterfall are Large to Very Large Projects which have very Static Requirements and with little or no External Factors or Systems impacting them. 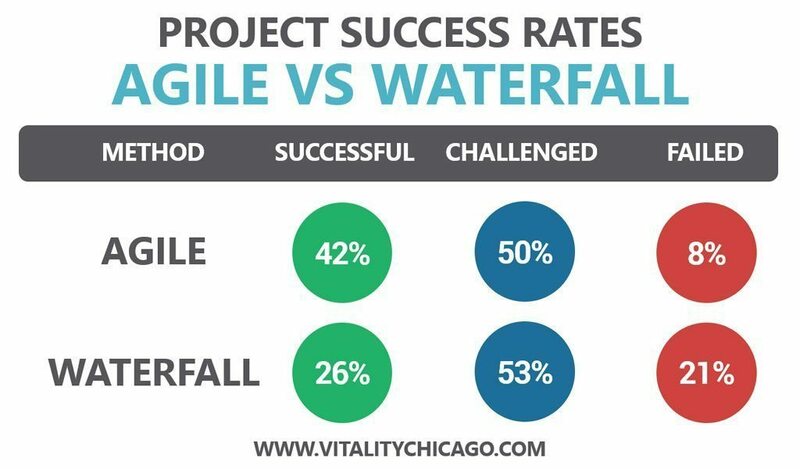 In such cases, Waterfall has greater chances of yielding Higher Quality Output in possibly than Agile. So, The thoughts presented in this write-up are an Introduction to Agile and Scrum. In real-time, What is it that is really followed/practiced in Agile Projects? I am mentioning this from my Own Experience of Working in Agile Projects (and Variants). If you have never worked in an Agile (or Variants) Project, you may find the following in an Agile Project. It is not that all of this never existed in Waterfall, but mentioning this in a (best-effort) sequence that you may come across in an Agile Development Project. I myself discovered these two separate manifesto's that are directly aligned to Agile Movement - One of them provides guidelines for Software Developers and other for Project Management. I am mentioning few salient points and the links where you can read more on these. In the real-world, as per me, you may not come across these as being used directly - but possibly being practiced without knowledge of such a Formal Manifesto. I am quoting from the site directly, http://manifesto.softwarecraftsmanship.org/ - You may visit the link and also sign the Software Craftmanship Manifesto. After reading this manifesto for the first time, I strongly feel that it has taken the Agile Manifesto rightfully ahead and should be a mandatory read for every Software Developer. The folks who are being introduced to Agile as Software Developers, should thoroughly note the points and make it a part of their Daily Activities and Tasks. Deliver Reliable Results by engaging Customers in Frequent Interactions and Shared Ownership. Happy Agile Development to All!